A gap in insurance coverage could be leaving Lyft and Uber drivers vulnerable. 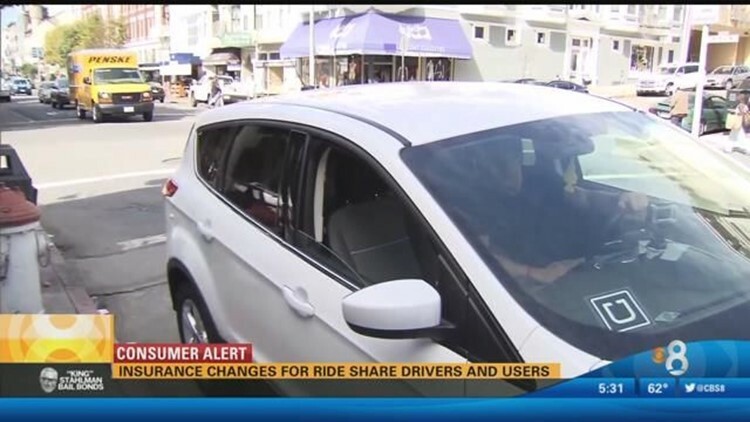 SAN DIEGO (CBS 8) - A gap in insurance coverage could be leaving Lyft and Uber drivers vulnerable. When riding in Uber or Lyft, many passengers question the insurance coverage provided for both passengers and drivers. Passengers can rest assured they are covered in case something were to happen, but there's a gap when it comes to drivers. There are approximately 12,000 Uber drivers in San Diego. Under state law, customers/passengers are covered but drivers are left unprotected. Bernardo Vasquez is an agent t with State Farm and he said companies like Lyft and Uber do not have to cover the driver's car. They will only cover if a driver damages another car or causes injury to a third party. A CBS News 8 producer received a notice in the mail alerting her about the exclusions in her policy if she were to carry "persons for charge." There are three periods as a ride sharing driver. Period one: when the app is on and drivers are waiting for a match with a rider. Period two: when the driver is driving to pick that rider. Period three: when the rider is in the car. For period one, Uber and Lyft will insure $50,000 per person, $100,000 per incident and $30,000 per accident. During periods two and three, that coverage increases to one-million dollar commercial liability policy. That includes comprehensive coverage if the driver's vehicle has collision coverage. The coverage during period one is only liability. So if a driver's car is damaged, neither the personal insurance nor the ride sharing companies will pay to fix the car. State Farm has jumped on board with other insurance carriers to offer options to its customers who drive for Uber or Lyft. A $500 premium would increase to about $550. According to State Farm agen Vasquez, as ride share companies continue to grow, insurance companies will have to do the same. State Farm began offering ride sharing insurance last week. Vasquez said drivers can contact their agents or the ride share company for more information on insurance plans. According to Uber and Lyft, they stand by the coverage they offer. They said they abide by state mandated laws.